Christine Atkinson being helped off an On Lok van by driver Esteban Escobedo. Part of getting older means you can’t get around like you used to. Maybe you can’t drive a car anymore, or hike up those big San Francisco hills to catch the bus. So a lot of seniors rely on private transit service: vans or shuttles to pick them up and take them places. One company that provides this service, among other things like senior centers and medical benefits, is On Lok Lifeways. You may have seen their big blue and green shuttle vans cruising around the city. Three women are waiting to board a van at On Lok’s 30th Street Senior Center, in San Francisco’s Bernal Heights neighborhood. The driver, Esteban Escobedo, helps three women board the van and starts up the engine. Camille Coats has been with On Lok for three years. Right now, she’s headed home. She says most days, she depends on the van to get out of the house. Coats says she likes being independent, getting out of the house and talking to people. She doesn’t hold back when asked what the van means to her. On Lok Lifeways started in San Francisco, where it serves almost a thousand people. It began as a senior day center in 1971, then expanded to include health services, home care, and transportation. It also operates on a smaller scale in Fremont and San Jose. On Lok gives almost 500 rides in San Francisco every day, to people like Coats. The vans drive to the senior centers, doctor’s appointments, and other On Lok activities. But Coats says it doesn’t go everywhere. Coats is friendly with the other women on the bus. It’s a fun ride. We pull up to an apartment building near the top of the hill, and Escobedo helps Coats off the van and makes sure she gets to her door. Then we’re off again, winding our way through Mission Bay, en route to Pacific Heights. Christina Atkinson will be dropped off next. She moved to San Francisco three years ago, when she was in a bad accident. “I was living over on State Street off the Castro, and I fell down the stairs, and I busted my head open, and I almost died,” she says. That fall left her severely disabled. She uses a walker and has memory problems. “I don't leave my house by myself. I have nurses that come seven days a week, and the bus picks me up in the morning, and it takes me home in the afternoon,” she says. Atkinson says On Lok’s services don’t cost her anything. “I didn't know that until recently, and I said, ‘Oh, that's good,’ because I don't have a lot of money for it to cost me something,” she says. A rep from On Lok says 96 of its participants have the program’s cost completely covered by Medicare and Medi-Cal. And there are other low-cost or free van-ride programs for seniors in San Francisco. The biggest is SF Paratransit, which is a private service overseen by the city’s Municipal Transportation Agency. 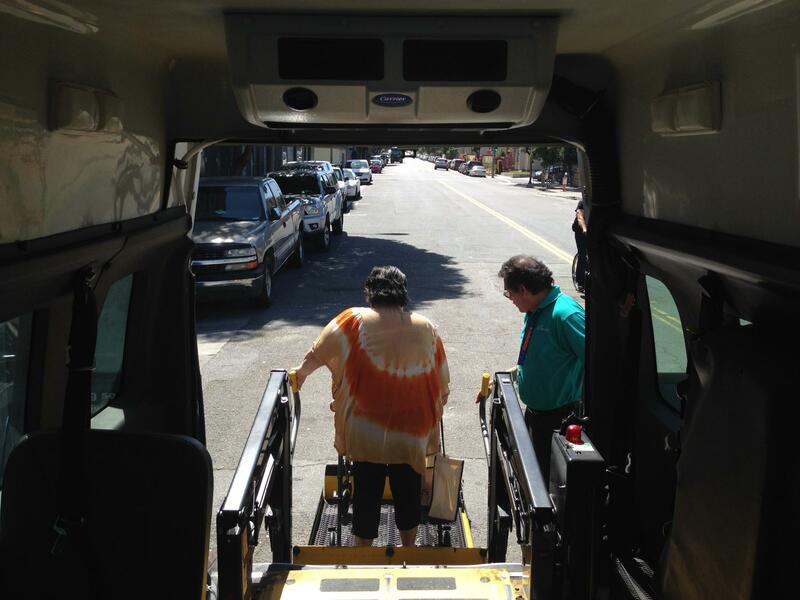 SF Paratransit serves over 11,000 seniors. The van stops in front of Atkinson’s apartment in Pacific Heights. Escobedo hops out and helps her use the lift in the back of the van. One the way back to On Lok, Escobedo pulls over to the side of the road so we can talk. He tells me he started working at On Lok in 1989, and he used to be a cook. Escobedo says he started driving the van three years ago, and that he loves his job. To prove his skills, he rattles off “good morning” in Chinese, Filipino, and Japanese. Escobedo says he feels like he’s doing a good thing, because the seniors rely on him to get around, but he also feels grateful to the seniors. Almost 15 percent of San Francisco’s population is over the age of 65. That’s nearly 120,000 people. For those who can’t get around on their own, transit services like this get them out and about and living.